In the midst of a contentious American election cycle, nostalgia for the Reagan years proved robust this week, as more than 400 lots from the former president and first ladys estate soared past their high estimates to total more than $5.74 million at Christies New York. Ronald Reagan’s cowboy boots, circa 1981, which carried a high estimate of $20,000. 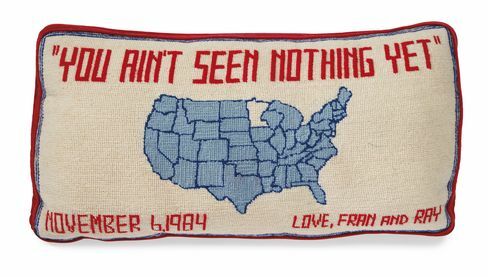 While the sale’s original $2 million estimate was almost aggressively conservative, few could predict that much of Reagan memorabilia would sell for 1,000 percent or 2,000 percent above its official valuations. 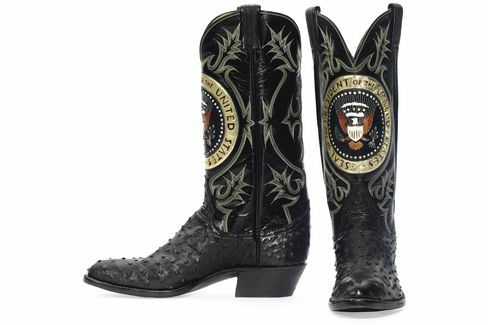 A pair of Ronald Reagans cowboy boots, replete with presidential seal, carried a high estimate of $20,000 and sold for $199,500. 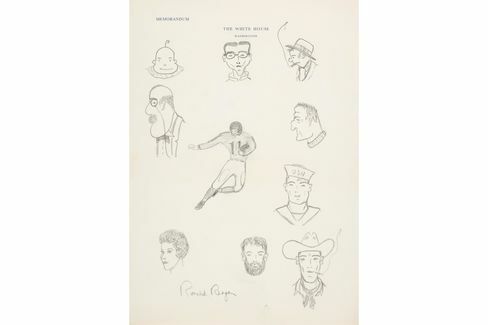 A page of pencil sketches, doodled on White House stationery and signed Ronald Reagan, was estimated to sell for $3,500; an eager buyer paid $100,000. 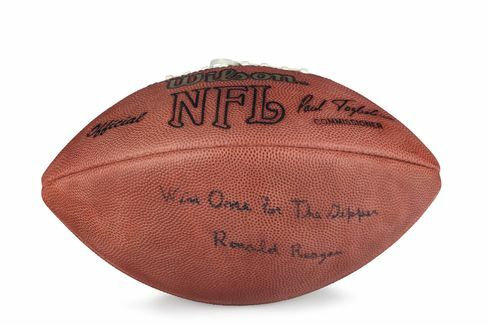 An official NFL Wilson football, signed and inscribed by Ronald Reagan, carried a high estimate of $10,000. The list goes on: An unused football, signed by Ronald Reagan and inscribed Win One For The Gipper, sold for $93,750 over a high estimate of $10,000; a concrete shard of the Berlin wall, signed by Reagan and decorated in neon graffiti, was meant to sell for $20,000 and sold for $277,500; even a collection of knickknacks from the presidents desk, including a glass jar filled with Reagan’s famously-beloved jelly beans, sold for $32,500, 1,500 percent above its high estimate of $1,000. A page of pencil sketches by Reagan, on White House stationary, was estimated to sell for $3,500. With buyer’s premium, it sold for $100,000. This kind of presidential bidding frenzy has a precedent in the form of the 1996 Jacqueline Kennedy Onassis sale at Sotheby’s. More than 6,000 of the former first lady’s belongings carried a pre-sale estimate of $4.6 million and ended up totaling more than $34 million. An oak rocking chair that Kennedy used in the White House sold for $442,000; a plastic model of Air Force One sold for $48,875; and even Onassiss 1992 BMW 325i, estimated to sell for $22,000, sold for $72,500. The mixture of nostalgia, celebrity, and glamour proved irresistible. 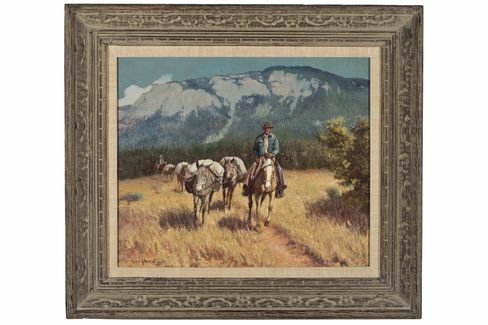 The Diamond J Wrangler by Olaf Karl Wieghorst, was estimated to sell for $4,000 to $6,000. Those same impulses seemed to be in play during the Reagans two-day sale on Wednesday and Thursday. And while the distinctly presidential pieces of memorabilia did particularly well, more intimate, domestic relics also exceeded expectations. 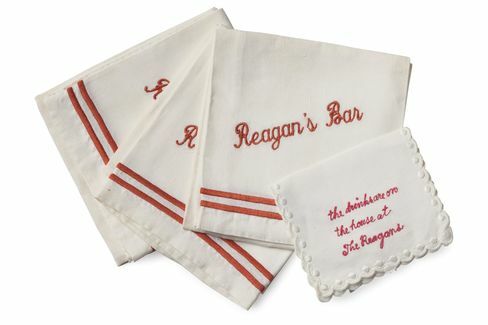 A set of bar napkins, monogrammed with the words Reagans Bar, sold for $7,500 above a high estimate of $400, and a needlepoint cushion from 1984, inscribed with the slogan You Aint Seen Nothing Yet, sold for $71,250 over a high estimate of $1,500. A 70th birthday gift to Reagan sold for more than $71,000. Nancy Reagan proved to be as compelling as her husband. 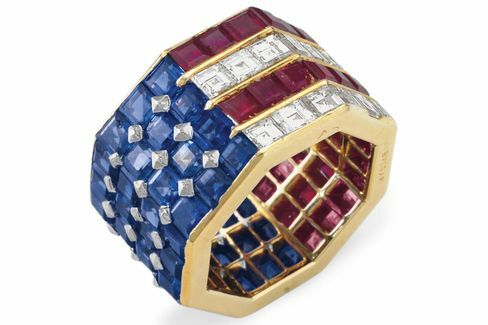 Her American Flag ring by Bulgari, estimated to sell for $8,000, was the auctions leading lot, totaling (with premium) $319,500. A pair of Elizabeth II silver beakers bearing the monogram N R (a gift from Margaret Thatcher) carried an estimate of $2,000 and sold for $52,000. A collection of bar napkins, estimated to sell for $400. 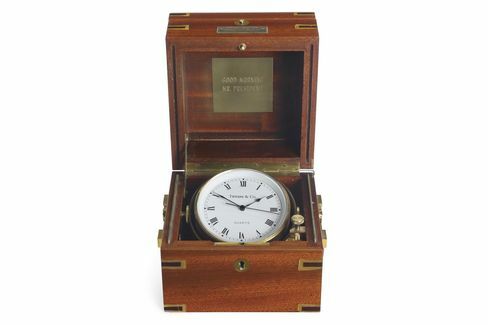 A Tiffany clock given to Reagan by Frank Sinatra on the occasion of his first inauguration, which carried a high estimate of $10,000. While the live auction has ended, an additional 260 lots are currently on offer in a separate online sale that will culminate on Sept. 28. Proceeds of both auctions will benefit the Ronald Reagan Presidential Foundation & Institute. A diamond, sapphire, and ruby ring by Bulgari, which was the highest-priced lot of the sale. 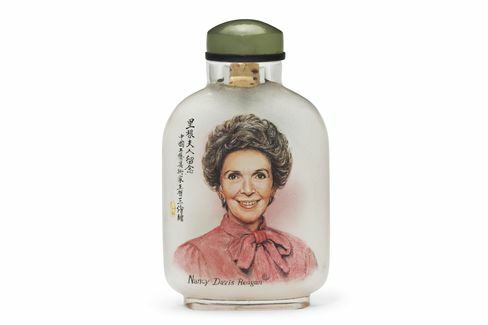 A Nancy Reagan snuff bottle and stopper, estimated to sell for a maximum of $3,000, sold for $27,500. 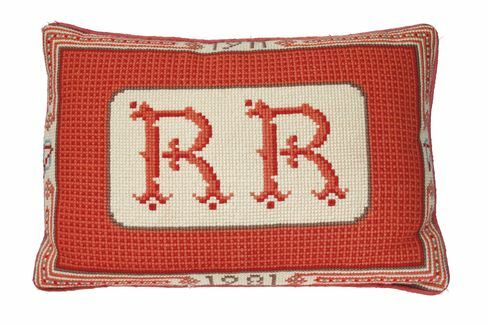 A needlepoint cushion, which was estimated to sell for $1,500, sold, with premium, for $25,000.